An area rug is typically the visual centerpiece of a room and is therefore one of the most important sections of flooring that you need to maintain. But cleaning an area rug is not the same as cleaning your carpet, which is why Doctor Steamer takes the time and attention examine each rug carefully to determine which cleaning method would be most appropriate. 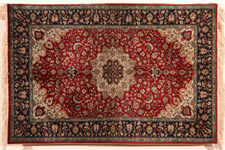 For inexpensive synthetic fiber area rugs, Doctor Steamer uses the traditional Hot Water Extraction method. Doctor Steamer takes the time and attention examine each rug carefully to determine which cleaning method would be most appropriate. For heavily soiled or expensive rugs made with natural fibers and dyes, Doctor Steamer recommends a more extensive cleaning process. Since natural fibers are easily damaged and dyes can bleed or loose vibrance with the Traditional Hot Water Extraction method, Doctor Steamer employs a trusted specialist who has been in the business of cleaning area rugs for over forty years. At his special facility, your area rugs are carefully hand-treated and hung dry to preserve the workmanship, color vibrance and durability of your area rug. When the cleaning is complete, Doctor Steamer returns and installs the rug in your home. Pre-Inspect – look for fading, discoloration, stains, wear, pre-existing damage, color instability and odors. Pre-vacuuming- to remove up to 80% of dry soils. Pre-Treat – spots, spills and stains using the most advanced spotting techniques. Rinse – to further remove soil and cleaning residue (to restore the natural feel).